Comparing the enthalpy changes of combustion of different alcohols. Comparing the enthalpy changes of combustion of different alcohols. Planning What are alcohols? Alcohol is the common family name for the hydrocarbon group alkanols. They are part of a homologous series. At least one of the hydrogen groups in the molecule is replaced by an -OH group. H H H H H H | | | | | | H - 1C - 2C - 3C - H � H - 1C - 2C - 3C - H | | | | | | H H H H OH H Propane Propan-2-ol They are all organic compounds. The general formulas for the alcohols are: CnH(2n+1)OH Where n represents a number. The first and simplest member of the alkanols family is methanol. Its molecular formula is CH3OH. You can now see that each member of the alcohol family has a different number of carbons in its structure. They increase by one carbon atom and two hydrogen atoms each time. All combustion reactions are exothermic which is why all enthalpy of combustion values are negative. The question that this piece of coursework is going to answer is "Is there a relationship between the number of carbon atoms in a chain and the enthalpy change of combustion?" Aim The aim of this experiment is to prove that the longer the hydrocarbon chain the higher the amount of energy transferred to the water, therefore fewer moles of fuel will be used to achieve a temperature rise of 15�C. The enthalpy change of combustion is the amount of energy transferred when one mole of a substance burns completely in oxygen (always -ve). To work out the enthalpy change of combustion of the alcohols the energy output must be measured. The easiest way to do this accurately is to use the thermal energy of combustion to raise the temperature of a substance with a known specific heat capacity, (the amount of energy required to increase the temperature of 1g of a liquid by 1�C). ...read more. 0.83g 0.60g 1.26g Starting temperature of water (�C) 20�C 16�C 23�C Final temperature of water (�C) 35�C 31�C 38�C Butan-1-ol Replicate one Replicate two Replicate three Weight of spirit burner before (g) 246.28g 243.43g 241.06g Weight of spirit burner after (g) 244.69g 242.01g 239.69g Change in mass of spirit burner (g) 1.59g 1.42g 1.37g Starting temperature of water (�C) 23�C 20�C 23�C Final temperature of water (�C) 38�C 35�C 38�C Butan-2-ol Replicate one Replicate two Replicate three Weight of spirit burner before (g) 171.37g 170.44g 169.21g Weight of spirit burner after (g) 170.15g 169.20g 168.03g Change in mass of spirit burner (g) 1.22g 1.24g 1.18g Starting temperature of water (�C) 21�C 22�C 23�C Final temperature of water (�C) 36�C 37�C 38�C Propan-1-ol Replicate one Replicate two Replicate three Weight of spirit burner before (g) 267.91g 264.45g 233.98g Weight of spirit burner after (g) 266.71g 263.26g 168.03g Change in mass of spirit burner (g) 1.20g 1.19g 1.18g Starting temperature of water (�C) 21�C 20�C 23�C Final temperature of water (�C) 36�C 35�C 38�C Propan-2-ol Replicate one Replicate two Replicate three Weight of spirit burner before (g) 238.43g 237.23g 236.08g Weight of spirit burner after (g) 237.23g 236.08g 234.87g Change in mass of spirit burner (g) 1.20g 1.15g 1.21g Starting temperature of water (�C) 22�C 21�C 20�C Final temperature of water (�C) 37�C 36�C 35�C The mass of the alcohols both before, after and the change in mass is to 2 decimal places. This is because the digital balance weighs to this degree of accuracy. The measurement taken with the thermometer is to one whole number because this is the degree of accuracy that the thermometer has. Analysing evidence and drawing conclusions. Calculations. 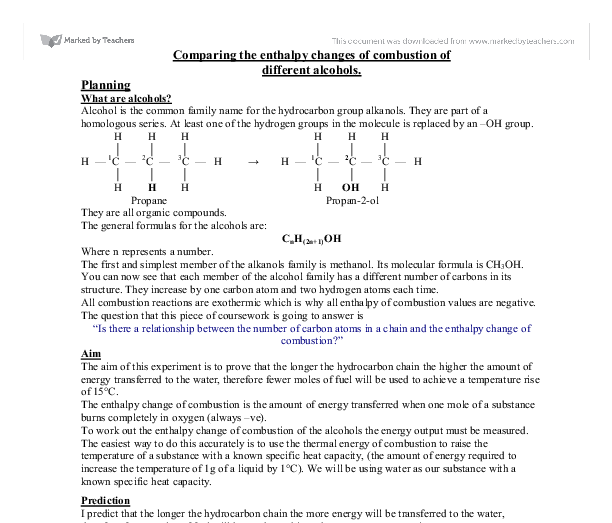 Now that I have my results, I will work out the enthalpy change of combustion (?Hc) for each alcohol. I will work out the ?Hc for each replicate for each alcohol and then work out the average ?Hc. ...read more. The reason that the incomplete combustion would have such a large effect on the overall results would be that the products formed from incomplete combustion release less energy than the products that are formed from complete combustion. The equations for the complete combustion of the alcohols used are, Methanol CH3OH(l) + 11/2O2 O(g) � CO2(g) + 2H2O(l) Propanol C5H11OH(l) + 8O2(g) � 5CO2(g) + 6H2O(l) Butanol C4H9OH(l) + 61/2O2(g) � 4CO2(g) + 5H2O(l) Pentan-1-ol C5H11OH(l) + 8O2(g) � 5CO2(g) + 6H2O(l). Even if I could weigh out all of the soot and work out the number of moles of carbon, there would be no way of getting all of the soot off the can. In the calculations we do not account for the energy lost as light energy. This would represent a significant amount of energy. The best way would be to minimize the overall distance between the calorimeter and the flame and have a calorimeter with a larger surface area to absorb more heat from the flame. In order to reproduce the experiment and obtain a higher degree of accuracy of results that are closer to the actual values in the data book, there are some subtle changes that will need to take place. 1. The calorimeter we used consisted of a basic copper can. In reality a calorimeter looks like this I would use this piece of equipment. I could not use this in the experiment that I carried out because the school does not have access to this type of equipment. 2. The calorimeter would have a lid on it to stop any heat escaping that way. 3. As already said an oxygen feed to provide excess oxygen would be set up to ensure that complete combustion occurs. 4. The distance between flame and calorimeter would therefore be reduced. 5. Surface area has been increased. 6. Use distilled water instead of tap water. Sources used in the evaluation. 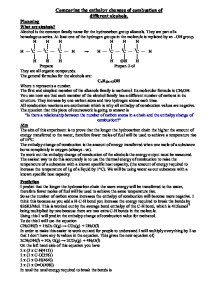 * Chemical Ideas, second edition page 106 - Specific heat capacity * Picture from Google. Site address:-http://www.personal.psu.edu/staff/d/c/dcw1/graphics/calorimeter.gif&imgrefurl=http://www.personal.psu.edu/staff/d/c/dcw1/graphic_art_examples.html&h=277&w=288&sz=15&tbnid=qg4P3zGdnlwJ:&tbnh=105&tbnw=109&start=1&prev=/images%3Fq%3Dcalorimeter%26hl%3Den%26lr%3D ...read more. The above graph shows that the majority of people (7 people) would not be willing to go without cosmetics if all cosmetics were animal tested, and 3 people might be willing to go without cosmetics. 6. Are you aware that the claims companies say about their products aren't always true? This process of filling and allowing the liquid to run away will be repeated to ensure that the pipette contains nothing but the solution. The pipette has a percentage error of 0.06. Burette Burettes are also more accurate than measuring cylinders. Most of these fuels are liquids at room temperature. Liquid fuels can present storage problems and other hazards, especially petrol, which contains very volatile hydrocarbons. A fuel vapour/air mixture can ignite very easily so a small spark several metres from a petrol spill can cause a fire. gives 15556J x 88 1000 = 1369J Analysis of Results The results shows that there is a inverse proportion between the structure and the amount of time it takes to heat up the water. The graph shows this in the curve of best fit. Therefore, bond breaking is an endothermic process whereas bond making is exothermic. When an exothermic reaction gives heat out to the surroundings, the chemical reactants lose energy. The products have less energy than the reactants. Chemical reactions involve bond breaking followed by bond making. The first three alcohols only exist in one form and the fourth only exists in two. These substances are extreamly flammable therefore have to be treated with caution. Methanol is also toxic so its use will have to be limited to yhe fume cupboard.